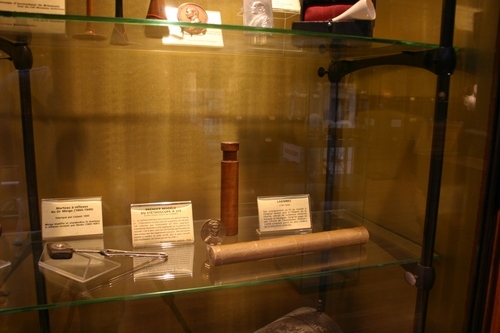 In the Musée d'Histoire de la Médecine of the Université Paris Descartes in Paris you can see a couple of original stethoscopes belonged to René Laennec. 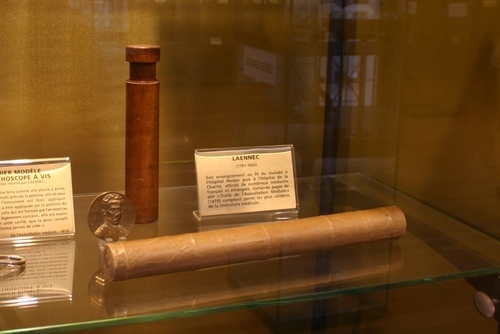 The one on the back of the shelf it is a wood specimen turned by Laennec himself. The one in front (original too?) seems to be made of tightly rolled paper, such as the very first one described in the De l'Auscultation médiate (Paris 1819)1. 1. See the original text.